I like me some martial arts in my movies. That doesn’t mean I inordinately love martial arts movies, but if you give me some awesome fight scenes, I’ll forgive a lot (though not anything, as I still haven’t forgiven Ong Bak 2 for not being Ong Bak). I also tend to enjoy a lot of Korean movies. Having lived there, I have a soft spot for them, and there are some really, really awesome flicks from out of South Korea. And here comes the Warrior’s Way. 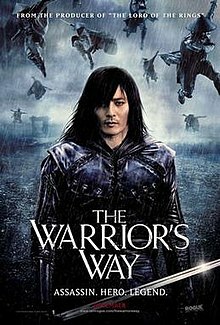 It’s got a Korean heart-throb/action star and a Korean director, but seems to be a Western film, in both senses of the word. This seems like a North American production with at least some of the film in the Western genre–but straight Western, rather than a pastiche, like the awe-inspiring the Good, the Bad, and the Weird. There’s a trailer and a TV spot out now, from which I deduce that the main character is supposed to be Japanese rather than Korean. That kind of pisses me off, but that’s likely something to do with financing and targeting the American audience. Considering the animosity Koreans feel for the Japanese, that might not float so well back in the Republic. I’m tentatively optimistic about this movie, and if it hits Ottawa, I’ll try to get a babysitter so the long-suffering wife and I can check it out together. This entry was posted in News and tagged action, Korean cinema, martial arts, movies, The Warrior's Way. Bookmark the permalink.